Cast iron cooking has been around for centuries. Throughout the history of our country, from the colonists who fought for independence to the settlers pushing west, the durable and dependable Dutch oven was there. Even today it remains of staple of outdoor cooking for Scouters, campers, expedition guides and RVers. Cast iron is durable (handed down for generations) and holds the heat extremely well. Of particular importance is that as you use it, the pot becomes more seasoned, adding flavor to any dish. This is the centerpiece. Made of heavy cast iron, the Camp Dutch Oven is designed to cook food outdoors just like an oven, with heat below and on top. Today, that heat is usually provided in the form of charcoal briquettes instead of coals from a wood-burning fire. By adjusting the amount of charcoal under the oven and on top, you can regulate the temperature inside. Camp Dutch Ovens are used for a wide range of one-pot dishes, such as stews and the popular Mountain Man breakfast. They can also be used for desserts, namely the immensely popular apple cobbler. 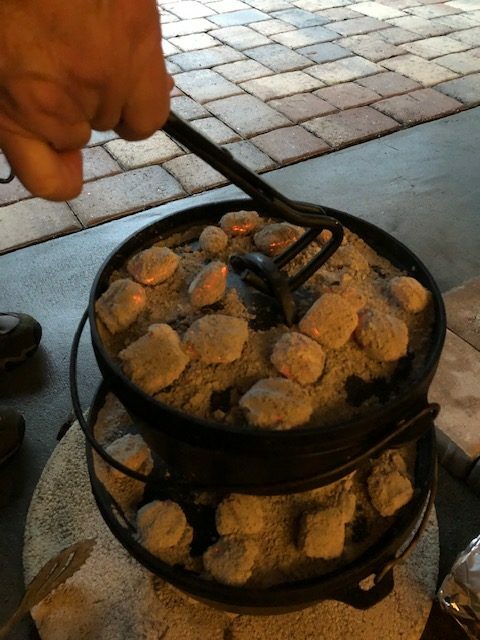 Camp Dutch Ovens have two distinguishing features: the lid and the feet. The lid is mostly flat and has a lip on the outside edge to keep the charcoal from sliding off. The lid can also be inverted to become an impromptu skillet for eggs or pancakes. 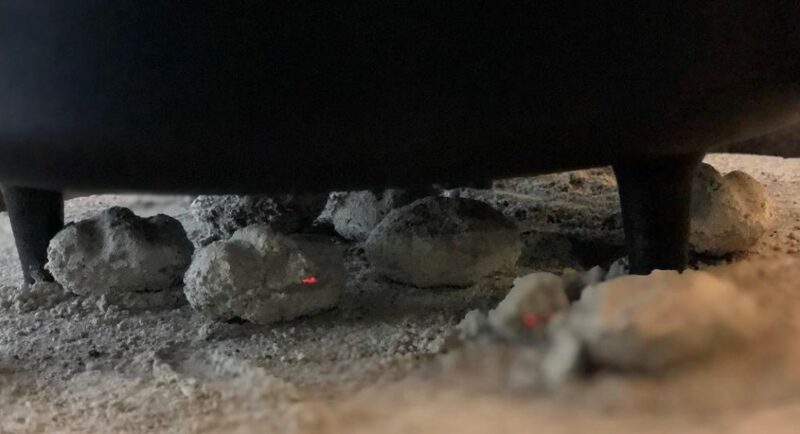 There are three “feet” on the bottom so the oven can stand just over the coals without crumbling them. 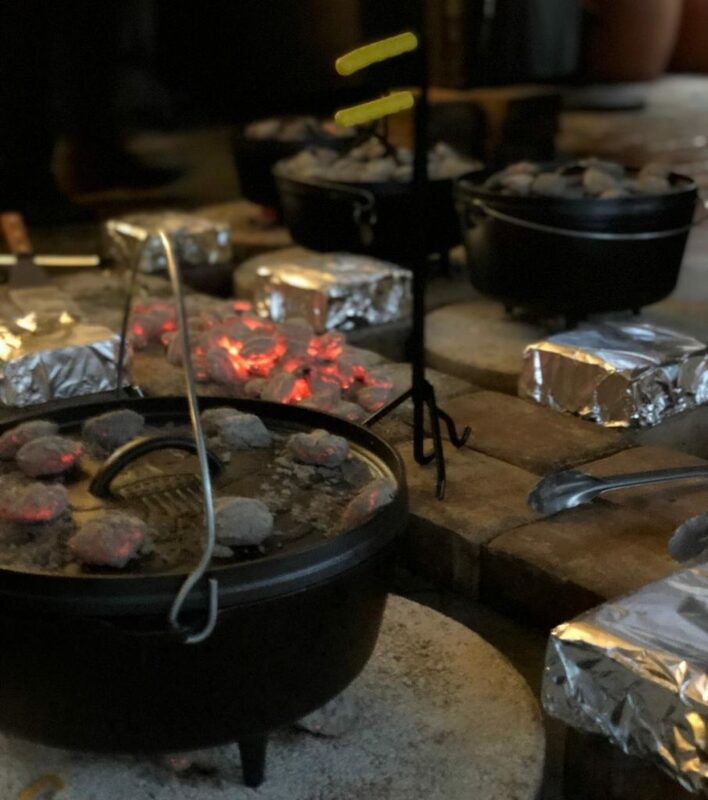 Camp Dutch Ovens come in a variety of sizes, mainly from 8 inches in diameter to 14 inches with a volume of 2 to 10 quarts. Camp Dutch Ovens also have a handle, so they can be moved easily and suspended above a campfire. You’re definitely going to check on the contents while cooking, so to peek inside, you need a lid lifter. 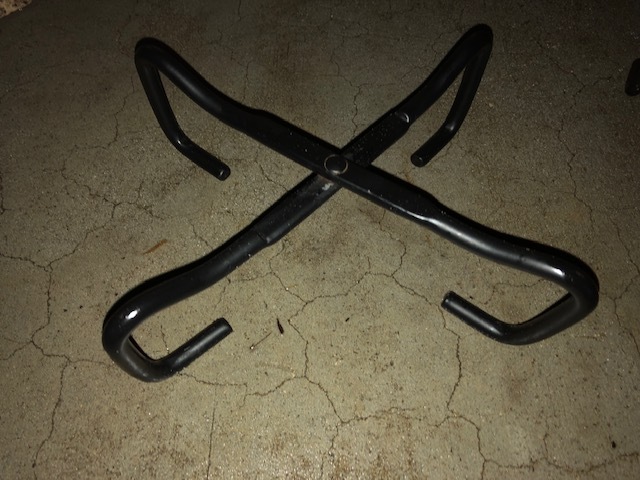 The basic lifter is nothing more than an iron hook with a handle so you don’t burn your hands. More modern lifters have more of a slide lock to them so the lid doesn’t wobble as much. This simple X-shaped device can actually function in many ways. Most cooks use it as a resting spot for the lid when they need to stir the contents. You don’t want to put the underside of your lid in the dirt and then back over your food. Yuck. In a pinch, it also could serve as a lid lifter. If you have a regular Dutch oven without feet, stick the pot holder into the charcoal and rest the oven on top. Another clever use is to put it in the charcoal, then invert the lid into a skillet and cook eggs. It takes a bit of time for charcoal to ignite and turn white. The charcoal chimney is made of aluminum, with air slot throughout. This speeds up the heating process. Put some paper at the bottom then fill the can with charcoal. Light the bottom then wait for your charcoal to ignite top to bottom. When ready, dump onto your cooking stand or fire pit. It happens; food sticks to the inside of your Camp Dutch Oven. To reduce the mess, line the inside of your oven with parchment paper or aluminum foil. Cleanup is a breeze. If you don’t want to constantly bend over, the cooking stand will hold everything at about waist height. The optional wind shield reduces heat loss. The legs disassemble for easy packing and storing. A must-have for cleanup time. Because you NEVER wash your cast iron with soap, you generally scrap away any stuck-on food and rinse with water. The scraper fits easily in your hand, and depending on how you hold it, it contours to the many shapes of cast iron cooking vessels. You’re working with hot stuff. To prevent burns use a handle grip and thick gloves or oven mitts. Tongs come in handy for arranging the charcoal.